Now with 23 pairs - a more than $35 value! Our unique trial pack of 23 assorted industrial reusable ear plugs (1 pair of each) lets you find out first hand which reusable ear plugs you, your family, or your work group prefer. 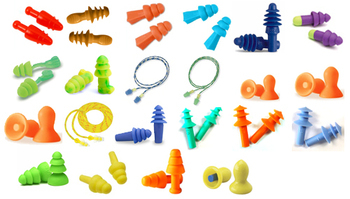 We heavily discount the price to make it easier for you to try a wide range of these great reusable ear plugs. This assortment of ear plugs would cost over $35 if you bought all of these ear plugs separately! This trial pack is an ideal solution for businesses trying to choose which ear plugs to stock for employees. Provide a trial pack to each employee and then ask them to vote. The results will tell you which ear plugs you need to stock to satisfy everyone in the workplace. To help you with your search, we have listed the ear plugs first by NRR, then from least to highest price. Reusable Industrial Ear Plug Trial Pack (23 Assorted Pairs)4RonOctober 11, 2017I do not understand all the low reviews. This is a 21 pair "TRIAL" pack. The whole object is to try them all or until you find one that works for you. If you bought them individually, it would be time consuming and costly. Reusable Industrial Ear Plug Trial Pack (23 Assorted Pairs)3LooJuly 20, 2017I'm On The 6th Pair Right Now. The Corded Ones And "Stemless" Ones, I Gave Away. For The Price, You Can't Beat It. The Two Complaints I Would Have, Is That I Wish The Stems Were Longer (I Got One Pair Stuck) And That The Plugs Were Wider, So That I Wouldn't Have To Insert Them So Far. Reusable Industrial Ear Plug Trial Pack (23 Assorted Pairs)5fletcherJune 17, 2013Good buy, I found a good match for shooting and another for the motorcycle. Reusable Industrial Ear Plug Trial Pack (23 Assorted Pairs)5SotiriosApril 23, 2013I bought these for my family and me since we all are into shooting sports but were not sure exactly which plug we'd like best. We are in Canada but the order arrived earlier than stated. So far so good.. love the plugs and the colours. Reusable Industrial Ear Plug Trial Pack (23 Assorted Pairs)5KevinMarch 30, 2013I liked most of the ear plugs in the pack and they worked very well. Reusable Industrial Ear Plug Trial Pack (23 Assorted Pairs)1DominicDecember 3, 2010I found the majority of these plugs did not fit me (of the two that fit they weren't that comfortable either). Most went too deep and hit my canal and not wide enough to block out the noises.